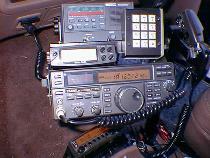 I operate HF mobile daily. At times I have only had the time to operate mobile as my spare time was almost non-existant. My current mobile station is pictured below. I just upraded my mobile station to a new Yaesu FT-847 as my older FT-840 system is rather outdated and instead of putting more money into it I have decided to get a more modern radio with tons of more features. 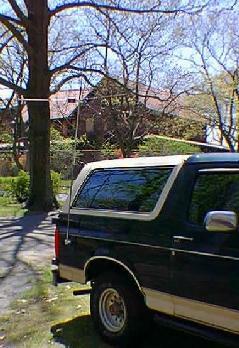 For one thing it has 6 meters at 100 watts, and my 54 inch hustler mast acts as a 1/4 wave 6m antenna when I use the Hustler resonators, for which the FT-847 allows the user to reprogam to use the common HF/6m connector if so desired in lieu of the separate 6m output connector on the radio. The new system is less bulky as well, as the SGC DSP filter and QSYer keypad are not be needed. Also the Radio Shack peak-reading VSWR/Watt meter has replaced by a Daiwa CN-410M unit. Since the FT-847 has a built in keyer and the DSP 400/200/100/25 hz. CW filter positions work so well I have started playing with CW mobile. I shall post additional photos when the installation is complete. For FM operation, even though the FT-847 is capable, I use a number of FM only rigs to keep an ear on the repeaters and conversly to keep an ear on HF or 6m SS/CW for a new one. An Alinco 20w rig with an old Regency 100w BAL-100 amplifier is my 6m setup and on 2 meters I use a Yaesu 1500M and for UHF I use a Kenwood TM-733A in UHF/UHF to monitor 443 and 447.925 mostly. 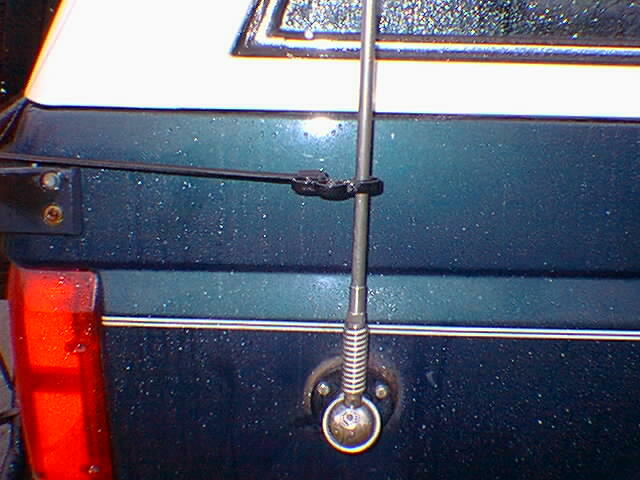 For HF, these day I run the W6MMA MP-1 manual screw driver antenna on my Bronco exclusively as I have found it a much better antenna than the Hustler reonsators. I am using the 54 inch huslter fold over mast with a 59 inch stainless steel whip on the MP-1 for operation through 12 meters. I use a shorter 48 inch whip with an overall length when on 10 meters is about 9 1/2 feet and goes to under 11 feet when down to 40 meters and under 12 feet on 80m when the extra coil is installed. 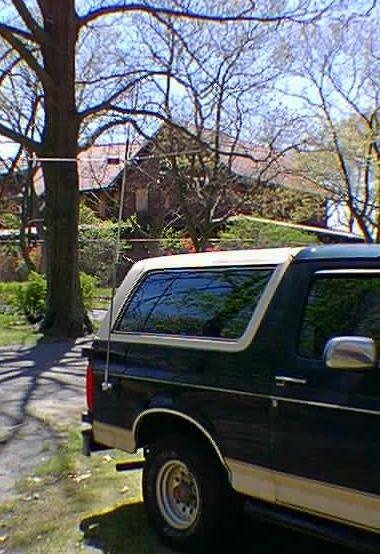 The photos below show the MP-1 on my Bronco with the slider all the way down for 10m operation. Obviously with the MP-1 on the mast I can not operate 6 meters as I can with the Hustler resonator pack I normally run. 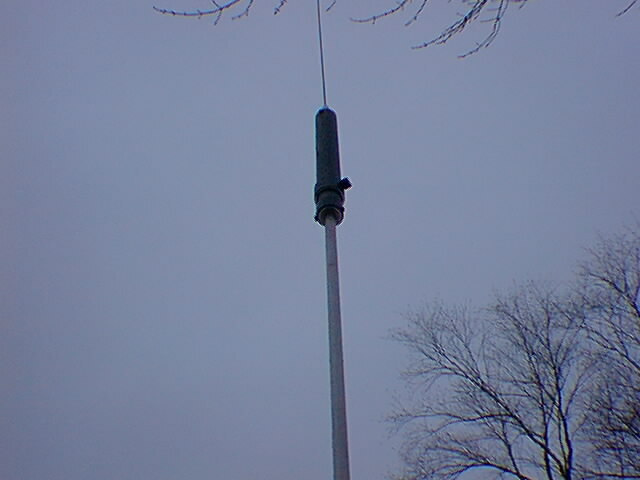 Below is a closeup of the MP-1 on the Huslter mast. In the photo below, on a rainny day, I snapped a shot of the Bunji cord that is connected to the mast and my tire rack for extra flex support for those fast stops. Below is a photo of my Crude Shield for the MP-1 antenna. I found that the crummy winter weather here in New Jersey builds up too much salt crude on the antenna that when wet really detunes the antenna. It rain for days and there is no detuning, but with the salt it is another story. With this home made Lexan cover created using a Deer Park .5 Litre water bottle the problem is all gone. The bottom of the bottle at the first rib is cut off and the mouth just above the nech angle is removed. Next the mouth is slice like an X and slid over the MP-1 slider body. A clearance hole must be drilled in the bottle for the nylon slider set screw. 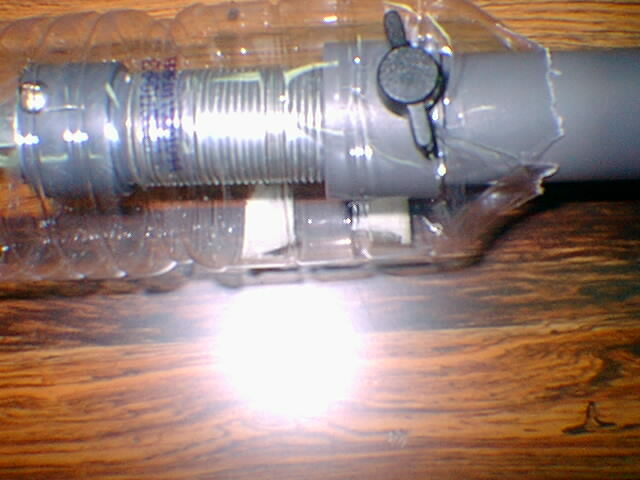 The top of the bottle must be secured to the slider body and weather sealed by electrical tape. 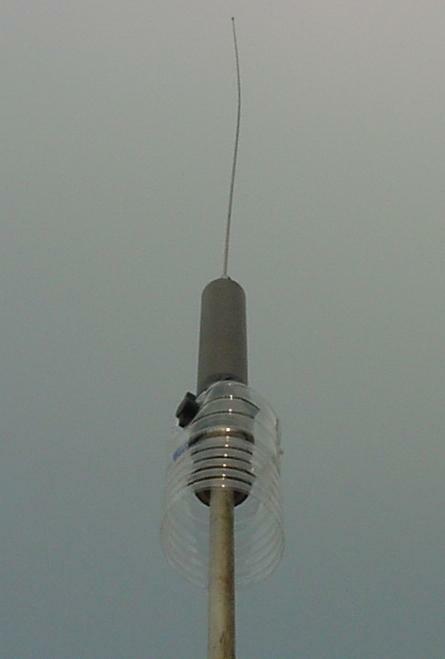 Click here for more information on the W6MMA MP-1 antenna. 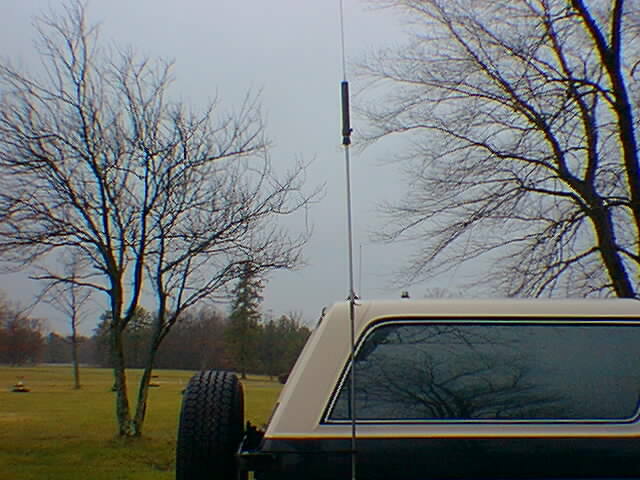 The photo below is a shot of my most previous HF mobile station in my 1993 Ford Bronco. The radio is a Yaesu FT-840. 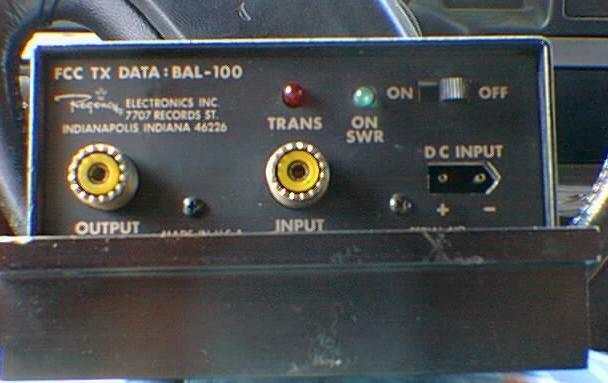 The keypad is an old QSYer to provide direct frequency entry. To the left of the QSYer is a Radio Shack digital peak reading Power/SWR meter that uses an external coupler and runs direct from 12 volts D.C. Behind the cross bar, on top of the system is an SGC Power Clear DSP filter. The mount is a wonderful IIX mount that is super heavy duty. 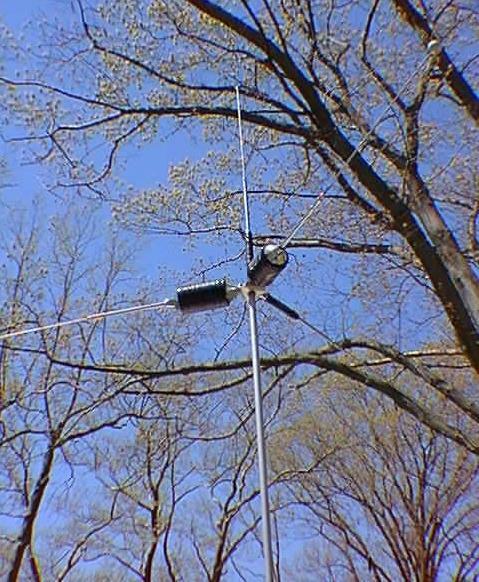 Normally I use a fold over Hustler antenna mast system and operate 75-10 meters. When we are not in the middle of winter weather I run four resonators on the mast. I usually have 20, 17, 15 and 10 meter resonators isntalled. For 12 meters I use the 10 meter resonator with a longer whip. In the winter I run one resonator at a time and also work 40 and 75 meters. I have recently bought a 30 meter resonator, but I have not yet gotten around to CW mobile. 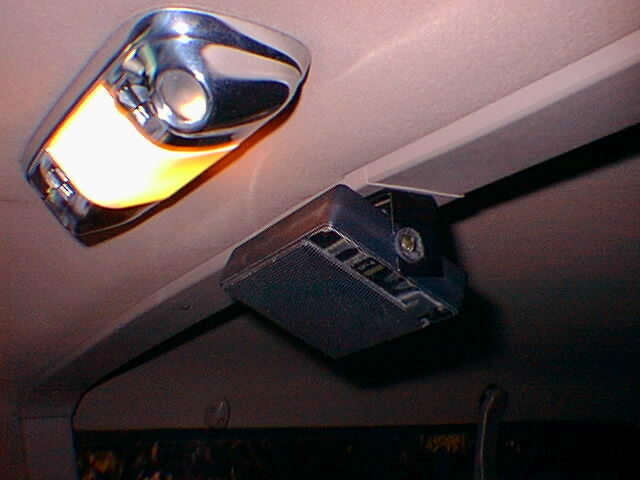 The external speaker is an SP-4 by Yaesu and is mounted just behind the dome light above the driver head as seen below. 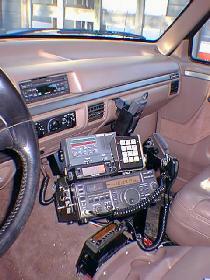 Below the HF rig is a Kenwood TM-733A dual bander which is mounted vertically to the front of the center console, two Yaesu SP-4 speakers are used from two different locations piping the audio toward the driver. 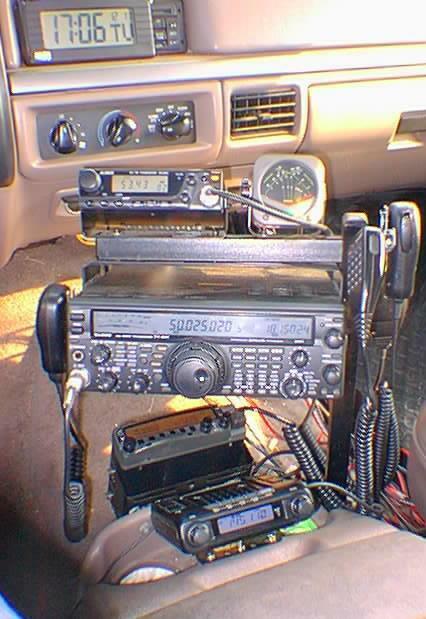 I use this radio daily and set if for cross band repeating with my Yaesu VX1-R mirco HT when ever I leave the vehicle and I am still within range for 500 milliwatts.